So then: the history of human evolution, Cirque-style. Men and women in Lycra frog suits bound through the space of a giant bone lattice as a spinning glitterball human is lowered from the roof. Curled up he is representing perhaps a newborn child or an ovum or a meteorite; he is wearing the creepiest costume ever seen: all sequins and mirrors, but covering his face and mouth so that it looks like he has perhaps found a public venue to wear and secretly revel in his ultra-niche fetish gear. There's some gymnastics on and within the bone structure, and then, giving it the benefit of the doubt, the plot splits and enters multiple timelines. 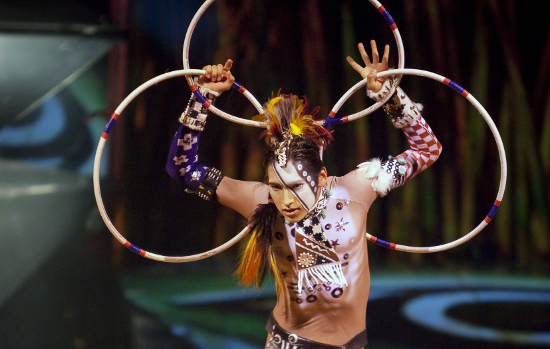 In North America, a young man is enacting a traditional dance with small, willowy hoops that are picked up with the feet and spun around his body into shapes that recall the wings and plumage of birds. On a beach in possibly Italy an age-old tussle between two bullish musclebound boys takes place over a girl in a bikini. In China, women on giraffe unicycles are using their fine motor skills to do incredibly difficult tricks flinging bowls by their feet to catch in stacks on their heads. The perspective pans out, far out. A klutzy projection of a lava flow splits as a strip of the stage is raised hydraulically to allow two women to emerge from dry ice, their skin lit blue-grey, their costumes silvery and revealing, headpieces somewhere between a centurion's horsehair helmet and Grace Jones' actual yet deeply unworldly hair – appearing uncannily like the sort of aliens Shatner would have gone for in Star Trek TNG, but aliens in this case whose skill in juggling spinning swatches of cloth on their hands and feet far outstrip humanity's own. In other words, as a chart of human evolution Totem is nonsensical. As a cabaret-ish piece of light circus entertainment it doesn't really hit the mark either. None of the elements sit well together, and not all of the elements are useful or good. There are two terrible clowns who have separately dreadful acts and then at the end, appallingly, combine their wilted, grey non-powers for a Jaws skit in a speedboat that must rank among the very worst of clowning. (I actually don't get it: however you feel about the theatrical achievements of their shows Cirque du Soleil at least seem to do pretty well capturing highly skilled and accomplished acrobats/aerialists/jugglers – why not clowns?) And then they seemingly spent all their money on the hydraulic stage strip that lifts to admit people from below – so there's nothing else but the bone grid, which for most of the show is chained away above the stage, and a line of ratty riverbank grass to conceal performers as they come off and on. Compared to Varekai's extraordinary stair-structure or Quidam's nerdily appealing rig it feels... underdone. A CDS show is always an arena to see some unusual skills. Here there's a perch routine – perch being an immensely-long, flexing pole balanced on the shoulder of a base so that flyers can then climb it; it can bow outward and rotate as well, somehow. For Totem, two burly men who look as though they may be father and son take it in turns to base an assortment of flyers, and it's impressive, and weird, and the troupe have obviously been doing it a long, long time, but as often happens the best and most charismatic gestures are those glimpsed through the cracks in the show's façade: here it's an older guy with a thick moustache who's been choreographed CDS-style and gives it his best shot, but still clearly can't bring himself to look serious and grave at the expected pitch. Likewise, always, there are some very good artists. An existing doubles trapeze act from Montreal graduates Rosalie Ducharme and Louis-David Simoneau is brought in, and though in adjusting for the Cirque style it loses some of its sulky energy, their vocabulary is still brilliant and original and surprising. It gets the biggest response of the night and answers the question of why bother to technically innovate for an audience that can't tell a new move from an old one: because originality finds its way out through other channels, and is felt as liveness, or daring, or personalisation, or ownership. The audience will just know. Greg Kennedy's conic juggling has the potential to be received on a similar wavelength, though its small scale doesn't suit the huge auditorium, and the decision to light the juggling balls in flashing disco colours pulls the routine away from its real beauty, which is simply the revelation of physics through patterning. In a similar way, hoop dancer Nakotah LaRance is utterly captivating, but this isn't the right venue for him or the dance (the cultural significance of which I read about after). In the end, that's how it is: the stuff that you can admire doesn't pull together, and, as is the norm for Cirque du Soleil, whenever you see a brilliant performance or an artist with integrity you mostly feel bad that they've been caught in this. Robert Lepage's involvement, as Totem's director, is undetectable and irrelevant. Reading an interview with him you might notice beneath the waves of disingenuity a fundamental disdain for circus as an artform, or at least a shortening of its potential as an expressive mode – but the takeaway here is that if you admire the man this probably isn't the class of work you expect to see from him, and you'd probably prefer to look away. This has nothing to do with the fact that Totem is a circus production. For the past two years the CDS shows at Royal Albert Hall have at least been slick enough for a heavily conditional recommendation, but this time round I think don't bother. It's an expensive ticket; you'd be much better served waiting for the Mime Festival. For more on Cirque du Soleil see their interview and profile in the book Panorama contemporain des arts du cirque. The company are also featured on the double-DVD compilation Le Nuancier du Cirque.